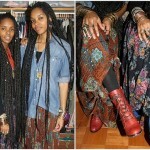 Pictured above is the amazing style of New York based London fashion blogger Karin of Wheredidyougetthat.com. I must state that I have a borderline obsession with all things fringe on vintage leather and suede bags but sigh….I can’t forget the shoes! « Urban Bush Babe: Tisha	» Hair Under Water….Aww Hell No! Can’t live without my off the shoulder slouchy top with a pair of fitted jeans.